Sierra club (this year): Co-sponsored program with the Sierra Club for low income Boulder students. Each month 10-12 students leave school early for a field trip to Goose Creek, a small feeder creek to Middle Boulder Creek. They are part of a City water quality monitoring program, taking water quality samples and passing them to the water quality department for analysis and recording. After their sampling, the CU Fly-fishing Club takes them fly-fishing on Boulder Creek and out for pizza. High school programs (3 years): Co-hosted a rivers conservation and fly-fishing program at Fairview High School in the Outdoor Ed. classes. Students were instructed in fly tying, casting and rivers conservation on local streams. Each semester ended with a trip to weekend fishing trip to Poudre Canyon. City of Boulder Youth Riparian Conservation Day: Co-hosted City-wide youth river restoration projects on Coal Creek and South Boulder Creek. Coordinated the revegitation of restoration sites where high-head dams were removed or modified for fish passage. 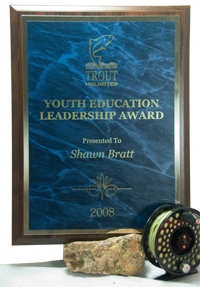 Co-founder of CTU Youth Camp: Originated in 2006, the camp has become an annual success attracting student ages 14 to 18 from throughout Colorado and other states for a week long camp focusing on rivers conservation and fly-fishing. Each camp culminates in a student restoration project and a promise from students to lead a conservation project when they return home. Flight Leader at Youth Camp (3 years) Former students have received project grants, written and passed a state resolution for water conservation, led other youth projects, participated in chapter projects, become summer guides in Colorado and Montana, and gone on to college to major in forestry, fisheries biology, and wildlife management. I feel it’s most appropriate to honor the man who not only got me personally into the fly fishing club here at CU, but has by far put in the most amount of time and effort out of every member over the past 10 years. 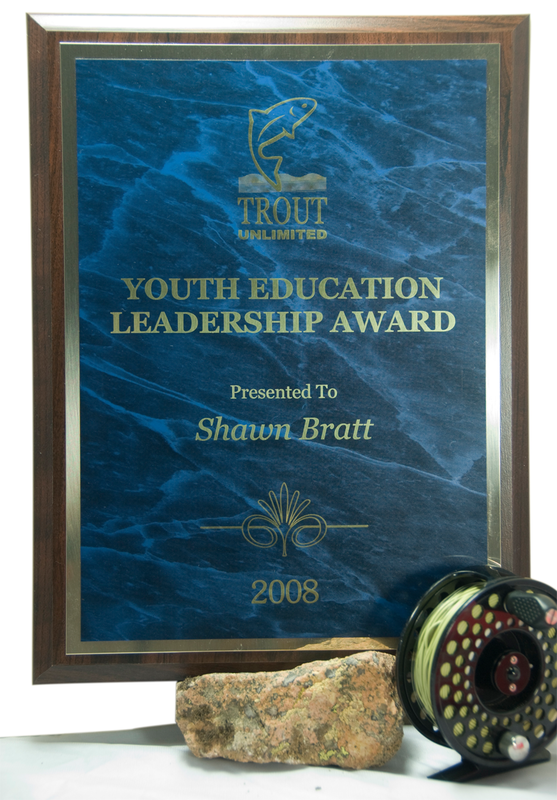 It all started my senior year in high school spring of 2003 at the annual Colorado Trout Unlimited convention. My dad came over to me and said that he wanted to introduce me to someone who was from CU and “knew how to fly fish.” I say that because my first thought was wow, someone who can go fly fishing with me when I enrolled at CU. Anyway, Shawn informed me about the club at CU and all the stuff they did from well …fly fishing of course, to fly tying, entomology etc. Little did I know that CU had an official Fly Fishing club! Hell I’d be surprised if there were a group of guys that just fly fished. Anyway, my first greeting with Shawn lasted for only 5 or so minutes, he gave me his card and told me to call him when I got up to CU. A long and suspenseful summer went by and I was finally on my way to move into the dorms. It was either the very first or second night that I called Shawn about joining the club, and it was this very phone call that I believe makes Shawn for who he is. He told me that however much time I put into the club, I will get out of. See, Shawn strongly believes about giving, especially when it comes to fly fishing. And you don’t necessarily have to receive something first in order to give back. Shawn says it best, “If someone has taken the time to acquire knowledge, they should be willing to teach it to others who want to learn.” Whether its serving on the club’s board, the local TU Chapter, cleaning up a stream, teaching others how to fish or being kind to one another, your environment or even just yourself; these basic principals make Shawn not for just who he is, but how this club was able to prosper. Growing from just a handful of guys whose passion was fly fishing, Shawn has re-founded and put in timeless amounts of effort into this club from organizing trips, teaching casting, rod building, fly tying, fishing, entomology, serving on the club sports board and TU, Shawn has done it all. If there’s anything you should take from this just remember to be aware of your surroundings, give back, and you will learn a great deal more. Fly fishing is one of many aspects that make up life when one is noble and wise when you give back. If you ever have the opportunity to meet, or best of yet fly fish with this guy, do it. You will be amazed.